She sought to calm “understandable” fears, that someone hidden among these Syrians seeking shelter was an extremist waiting to attack. There were always going to be some who made the argument. The events of this weekend were calculated to make that fear insidious. Paris. Paris is a whole blog post on its own. One that will come later this week once I have been able to clear my head and figure out some complex emotions. For me, Paris wasn’t just about the horror of the innocent lives lost. Nor the fear of the implications it could have for the thousands still coming into Europe, desperately seeking shelter from the very people that attacked Parisians on Friday, November 13. For me, very quickly, I became entangled in the social media battle that ensued. As Facebook initiated its check-in safe feature for the first time in a terror attack situation, my feed became flooded with the same question: Why not Beirut? Beirut had been attacked the night before, a double suicide bombing that killed at least 46 civilians in the Burj al-Barajneh area. ISIS claimed the attacks. My friends in Lebanon began questioning why, when they were attacked by ISIS just 24 hours before France, did they not get given the option to check-in safe. Why the Lebanese flag wasn’t replacing people’s profile pictures in acts of solidarity around the world. Lebanese bloggers wrote eloquently. The debate had begun. I thought, perhaps naively in the social media age, that it would be confined to those in Lebanon. But soon I found people I knew from Scotland, angrily posting about being held to account by people who they said had only heard about the bombing in Beirut when it gave them the chance to moralise. High horses waged battle with high grounds and much was said, and much was needed to be said. But I will deal with that in due course. One thing I refused to engage with, was the inevitable rise of Islamaphobic nonsense hiding behind a disingenuous cover of fear. On the Saturday the news came. A Syrian passport had been found beside the body of one of the bombers. An initial check had its owner entering Europe via Greece, as a refugee. Cue finger pointing. Cue I told you so. Cue reactionary backlash against refugees. When I saw the initial headline my heart sank. 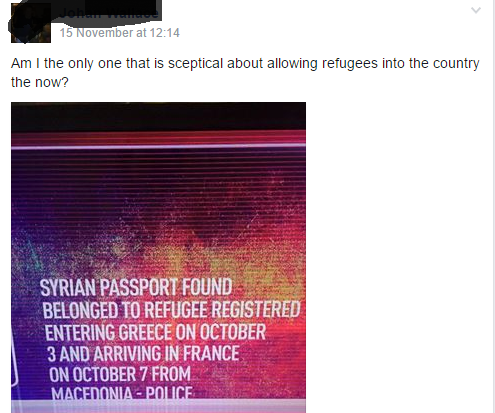 When a debate page I am on got its first – are we comfortable with the idea of refugees coming here after Paris – post, it sank further. When elected officials in Europe and in the United States began issuing statements against allowing refugees to settle in their respective countries and states. I got pissed off. This was exactly the reaction ISIS hoped to provoke. It came as no shock to me when news broke yesterday that investigators think the passport was planted deliberately. Was the damage already done? The refugees hadn’t even arrived yet when news came of possible revenge attack on Scottish Muslims, with the burning of a Islamic cultural centre in Bishopbriggs. Not the Scotland I want to live in. That’s why I took heart that the majority of the comments on the above post were in favour of the refugees. I took heart in the wide spread condemnation of the incident at Bishopbriggs. 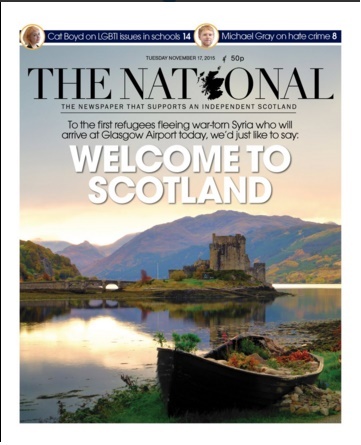 I took heart in the front page of The National. And then I decided to do something more. I looked up the Scottish Refugee Council. And found their site about volunteering. I gave them my details and said I could help with English teaching and translation. Having taught English as a foreign language in China I have some experience I could use to help some of the families relocating here. Having a decree in Arabic and living in the Middle East for so long I have enough Arabic language skills to help out in the transition. There were other ways to help – donation, accommodation, befriending. If you feel you can give your time or your skills please do. I told people on social media over the weekend that this was a displacement of people on a scale most of us had never seen in our lifetimes. I told people we had to react with humanity. I was being a keyboard warrior. There is merit to that. But doing something tangible, that’s how things change. A little bit of help from a lot of people goes a long way. This entry was posted in The Exponential Crisis, The Syrian Equation and tagged Beirut, Bishopbriggs, Burj al-Barajneh, Facebook, Glasgow, Greece, ISIS, Islamaphobia, Jordan, Lebanon, Nicola Sturgeon, Paris, Refugee crisis, Scotland, Syria, Syrian passport, terrorism, The National by Susan Wilson. Bookmark the permalink.